Brand new boutique condo community will be breaking ground this Spring in Downtown Sarasota, and reservations for these highly desirable homes at 1500 State Street are being taken now. Only 20 of these exclusive upscale residences will be available,. “This is the perfect concept for those that want low maintenance, reasonable costs and the ability to walk about everywhere," says Pam Charron. Brand new boutique condo community will be breaking ground this Spring in Downtown Sarasota, and reservations for these highly desirable homes at 1500 State Street are being taken now. Only 20 of these exclusive upscale residences will be available, offering carefree urban sophistication near everything in the heart of Downtown Sarasota. Available in a choice of 5 unique floor plans, ranging between 700 and 1,000 square feet, each of these units comes with 10-foot high ceilings, granite, tile, GE appliance package, washer/dryer, superior construction features and private terraces. Residents will enjoy the convenience of same-level adjacent assigned garage parking and secured elevator entry for the perfect lock-and-leave lifestyle that is unique for Downtown Sarasota. 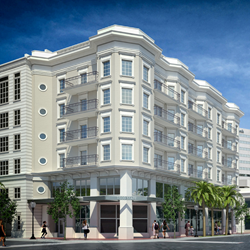 With a Walkability Score of 96, residents of 1500 State Street will be able to casually stroll to Bayfront Park, Marina Jack, Lemon Ave. Farmer’s Market, Main Street’s extensive shopping, dining and more. Pet friendly and with 30-day lease minimums, these units priced from the $370s will not last long. Talk to Berkshire Hathaway HomeServices Florida Realty REALTORS® Pam Charron and Kylie Jackson with Berkshire Hathaway HomeServices Florida Realty, are representing the 1500 State Street project for the BHHS Florida Realty team. Consistently ranked in the Top 1% of Sarasota Realtors® in volume, Pam is presently the #1 Sales agent for BHHS Florida Realty’s Sarasota region and in the top 1% of the network of over 40,0000 agents. With over 25 years of business ownership, sales and marketing experience. Kylie Jackson, a graduate of The University of North Florida Coggin College of Business, with a degree in Business Management, is proud to have the experience of working for the family business, Jackson & Associates, and has sound expertise in selling residential new construction. Pam and Kylie currently work under the leadership of Michael Holland, Managing Broker of the Lakewood Ranch / Sarasota/ Palmer Ranch Branch Sales Offices of Berkshire Hathaway HomeServices Florida Realty. Interested buyers and other inquiries should contact Kylie (941) 650-3915 or Pam (941-993-3388) directly. The 1500 State Street project is being headed up by the State Street Partners Development Team. This group of highly regarded and proven real estate development professionals offer an extensive and impressive portfolio of quality residential and commercial properties in the greater Sarasota area. Their vision remains to establish and develop premier properties with mindful though of design and architecture that will endure the test of time. The team consists of Real Estate Developer and Manager Dr. Mark Kauffman; Hembree & Associates President Joe R. Hembree; Jackson & Associates General Contractors, Inc. President/Founder Thomas Jackson; Elita Kane, and Prominent Sarasota design firm HOYT Architects. With over 41 locations, in 18 counties and over 1,750 Sales Professionals throughout Florida, Berkshire Hathaway HomeServices Florida Realty is the 5th largest brokerage among the affiliate Network brokers across North America. The network, among the few organizations entrusted to use the world renowned Berkshire Hathaway name, brings a definitive mark of trust, integrity, stability and longevity to the real estate market.